Concerned Citizens Of Offa Community in a press statement commend the activities of the Nigeria Police Force that have so far made some significant arrest in connection with the bloody bank robbery. 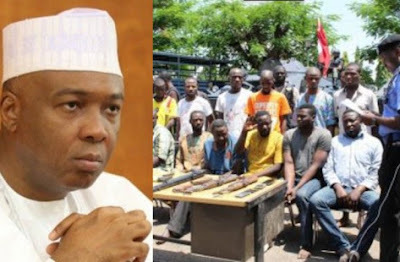 The confession and admission to crime by the suspects to the effect that they are political thugs of the Senate President, Senator Bukola Saraki who was alledge to have sponsored them with firearms, money and operational vehicles made the group demand for his step down from his current position so he can face his trial and clear his name. We wish to condemn in its entirety, all surreptious and dubious means and moves made in recent times to divert attention from the salient issues arising from the unfortunate bank robbery incident of Thursday 5th April, 2018 at Offa town where about 33 innocent lives were lost as a result of the activities of daredevil armed robbers that invaded the ancient town. At this juncture, we would want to commend the activities of the security agencies especially, the Nigeria Police Force that have so far made some significant arrest in connection with the heinous crime. The confession and admission to crime by the suspects to the effect that they are political thugs of the Senate President, Senator Bukola Saraki who was alledge to have sponsored them with firearms, money and operational vehicles is to say the least, very worrisome and disturbing. We were however alarmed to observe different methods adopted by some interest groups to distract the Nigeria Police Force from carrying out a thorough investigation on the matter. Particularly worrisome was the press statement issued by the National Officers of the Offa Descendants Union, Alhaji Najeem Usman Yasin, the National President and Chief Mrs Wosilat Macauthy, the National Secretary respectively, exonerating Dr. Bukola Saraki from any complicity over the incident. Also, the painstaking attempt made by the duo of High Chief Bayo Akinola, the Ojomu of Oloffa and Dr Tajudeen Oloyede, the Principal Private Secretary (PPS) to the Oloffa of Offa purportedly claiming to be speaking for the Oloffa of Offa by exonerating Dr. Bukola Saraki from any involvement in the robbery saga represents a very sad commentary in the the history of the town. The pertinent question here is whose interest is the Oloffa-in-Council trying to serve on this ugly incident? Absolving Dr. Bukola Saraki of any accessory to crime of this nature is not only an attempt to preempt, out of place but a self-serving move to distract the attention of the security agencies. This actually represents the vestiges of the general decay affecting our society. For want of a stronger phrase, we unequivocally condemn the obnoxious roles of the National Officers of The Offa Descendants Union (ODU) and the unfortunate press statement from the Oloffa-in-Council. It is painful to note that they have not really spoken the minds of the larger majority of Offa citizens both at home and in Diaspora. The general expectation was that these institutions which swore on oath to protect the interest of the community and ensure its development cannot for any reason, pre-empt and pre-supposes the outcome of the investigation on this heinous crime that claimed the lives of 33 members of the community. To say the least, both press statements were unguarded, misplaced and does not represent the feelings and aspirations of the Offa Community while it is also inimical to those factors that could fast-track togetherness, cohesion and love amongst the Offa citizens and the much cherished development of the town. The Officers if the umbrella body of Offa Descendants Union (ODU) are advised to be alive to their responsibilities by always being on the side of the people they pretend to be leading at any given trying periods. We expect from them a high level of steadfastness that would serve as a catalyst to the expected progress and development of the town through a purposeful and people-oriented leadership. We also implore the Oloffa-in-Council to portend on objectives and all-encompassing fatherly principles and roles that would ensure good leadership in leading the ancient town to the promised land at all times and to be conscious of those factors that may tempt the place to place primordial personal gains and aggrandizement above the collective interest of the community in allits endeavors. On behalf of the majority of Offa citizens at home and abroad, we want to assure the Nigeria Police Force and other security agencies that we are in tandem with them in their quest to get to the root of the sad robbery incident by bringing to book, all those that are found culpable or committed accessory to this gruesome act. The entire Offa community are eagerly calling for Justice not only to be done on this matter, but must be seen to have been adequately done by ensuring that all those found guilty face the full wrath of the law. It has really become expedient and imperative for Dr. Bukola Saraki to clear his name if he has no skeleton in his cupboard. He has a moral duty to clear his name, protect his integrity and that of the National Assembly which he represents as the Senate President. He is advised to step aside from his current position as the Senate President to allow for an unhindered and thorough investigation of the matter by the security agencies.